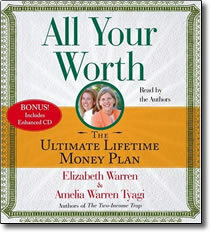 All Your Worth – Elizabeth Warren – MP3 audio download – Discount! You work hard and try to save money, so why is there never enough to cover all the bills, to put some away in your child’s college fund, to pay off your credit card debt — or to relax and have some fun, for once? In the New York Times bestseller All Your Worth, mother/daughter team Elizabeth Warren and Amelia Warren Tyagi — authors of the acclaimed The Two-Income Trap — tell you the truth about money. They lay out a groundbreaking approach to getting control of your money so you can finally start building the life you’ve always wanted. The result of more than twenty years of intensive research, All Your Worth offers you a step-by-step plan that will let you master your finances — for the rest of your life. The secret? It’s simple, really: get your money in balance. Warren and Tyagi show you how to balance your money into three essential parts: the Must-Haves (the bills you have to pay every month), the Wants (some fun money for right now), and your Savings (to build a better tomorrow). No complicated budgets, no keeping track of every penny. You’ll discover a whole new way of looking at money — and yourself — that will help you get your finances on track so you can enjoy peace of mind for the rest of your life.